Plan your next Pennsylvania country vacation to this charming 2-bedroom, 2-bath vacation rental condo. Golf at the King Valley Golf Course, ski at the Blue Knob Ski Area, enjoy a meal at one of the delicious local restaurants and finish the day with a soothing soak in the community hot tub. This 1,000-square-foot, ground-floor unit offers 6 lucky guests a forest-view balcony, wet bar, complimentary wine and chocolates, all of the mountain house essentials, and resort amenities! Picture yourself exploring the Blue Knob State Park by-day followed by sipping hot cocoa around the wood-burning fireplace by night! Nestled in the heart of the Blue Knob All Seasons Resort, this spacious condo offers the perfect balance of rustic decor and modern luxuries and even offers complimentary tole toiletries and kitchen supplies! Start your day with some coffee on the comfortable 3-person sofa and wait for your crew to wake up. From the old-school ski posters to the exposed wooden accents, you will never forget you're in the high alpine country of Pennsylvania. Be sure to check the weather on the flat-screen satellite TV before you decide on your daily adventure. Mix your favorite cocktail at the wet bar when you return to the condo and walk out to the private balcony to watch the sunset over the tree line. The thickly forested area surrounding the resort is part of what makes this area so peaceful. If the weather is too cold for the balcony, fix a roaring fire in the wood-burning fireplace and warm up the unit! Make memories with your travel companions by preparing a new recipe in the fully equipped kitchen, and then open your complimentary bottle of wine and chocolates at the dining table while you discuss highlights from the day. When it's time for bed, head to one of 2 comfortably furnished bedrooms to watch your favorite show on the flat-screen satellite TV while you drift to sleep. Additional accommodations can be found for up to 2 guests on the comfortable queen sleeper sofa in the living room. This condo is located inside the Blue Knob All Seasons Resort and has access to every amenity the resort offers, including an indoor pool and hot tub, steam room, sauna, fitness center, and seasonal outdoor pool. Golfers, simply walk across the parking lot to tee off on the highest alpine golf course in Pennsylvania! The free shuttle from the resort runs every 30 minutes to the slopes for some of the best skiing the area offers! Blue Knob Resort Mountain features 34 different trails with a wide variety of terrain, along with a tubing park for the little ones! Drive just under 11 miles to reach the King Valley Golf Course to work on your golf game! King Valley is one of the many Altoona-area golf options and offers a beautiful 18-hole course and complimentary golf carts with your greens fees! Another option is the on-site golf course known as the 'highest alpine golf course in Pennsylvania, located just across the parking lot. Blue Knob State Park offers hikes with mountains and steams - the perfect spot to plan a picnic. In addition, the Shawnee State Park is 40 minutes from your door and a fantastic option for a day trip. Enjoy exploring this former game preserve boasting scenic views of the area and the Appalachian foothills. Some options around the park include hiking, boating, fishing, and a multitude of exciting biking trails. Learn about the history of this historical area by driving 26 miles to the Old Bedford Village. The village is a fascinating display of what life was like for colonists populating this land and even shows detailed exhibits in the Fort Bedford Museum. This town is also home to the world-famous Bedford Springs Resort! - Enjoy access to top-notch community amenities including a fitness center, free shuttle to the mountain, indoor pool and hot tub, steam room, sauna, and more! - Fantastic Claysburg location inside the Blue Knob All Seasons Resort, an 11-mile drive from King Valley Golf Course, 40 minutes from Shawnee State Park, 26 miles from Old Bedford Village, and close to a variety of delicious local restaurants! Barry is a great guy. Excellent communication. Great location at Blue Knob ski resort. 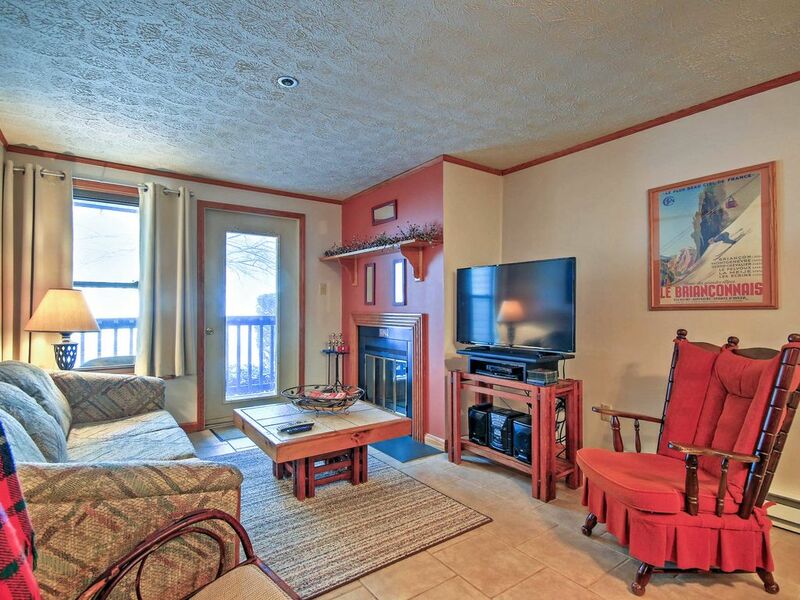 Great Condo 1 Mile to Slopes! We had a lovely weekend, condo was immaculate and had everything you could need! We really enjoyed this Condo. It was nicely renovated, very clean, and very nicely stocked with everything we needed for the weekend except our clothes and food. The bed was comfy and clean. Having TV and Wifi sevice available was the best! I have been staying at different locations at Blue Knob for many years now. I could never stay as long as I liked since there was no wifi available. It never made sense to me that you can get service almost anywhere in the world except Blue Knob. I am very happy to see this improvement! It was nice to have the paper towels, TP, and soap avilable. This is one less thing to pack and saves the time that would be required to drive 30 minutes to a grocery store. The kitchen was nicely stocked with everything we needed to cook and bake - and the pots pans and dishes were very nice and clean! We hope this will be available for us the next time we have to visit the area.